Today's guest post is from Catherine J. Byerly! I'm not necessarily a huge fan of annuities for young people, but there are a few circumstances in life where you may come into possession of an annuity through an inheritance or a structured court settlement. Either way, I figured I would educate myself on them further, which means free knowledge for you too! My main request for Annuity.org was that they create a guest post that touched on some cons of annuities in addition to the pros so my readers (homies) can make an opinion of their own. 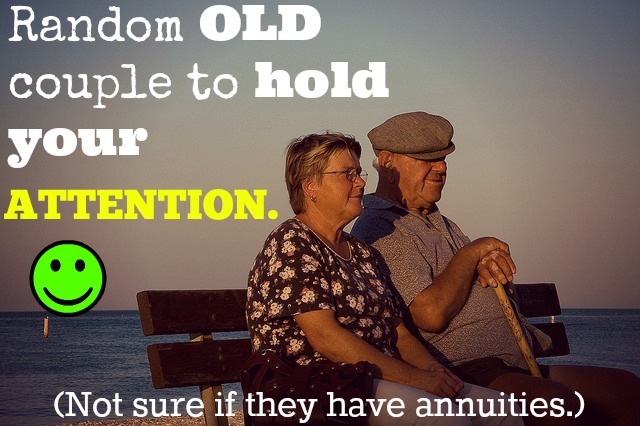 Enjoy, and please let me know what you think about annuities as an retirement tool in the comments below! If you don’t know what annuities are, don’t feel bad. When I first started business reporting I was pretty confused about what they were. Don’t worry, I’ll tell you everything you need to know to get you through your 20’s. Put super simply, an annuity is a contract with an insurance company where someone gives a lump sum in exchange for a series of payments in the future. Annuities are considered a financial product that offers stability because they don’t fluctuate like stocks, and they have some pretty serious tax benefits (while money is in an annuity an individual isn’t required to pay taxes on it). But enough of that stuff. Annuities are a popular retirement product, and typically best suited for purchasing later down the road. There’s no easy way to put this: If you’re getting an annuity in your 20s it’s probably because something pretty bad happened. So here are the two most likely scenarios of you encountering an annuity. Hopefully you’ll never be in a situation where someone you love has passed away suddenly and left you an annuity. But if that happens, you’re going to have a whole lot more important things on your mind than money, so it’s important to understand how they work now. More than likely, if you’re inheriting an annuity, it’s going to be a SPIA. A particular type of annuity, called a “single premium immediate annuity” or SPIA, is a financial product typically owned by retirees with the benefit of being able to be passed on to someone. Sometimes that someone is a spouse and sometimes that someone is a child. Take a stream of payments for the rest of your life. There’s no one-size-fits-all option among the three. If you’ve got unsecured debt or debt with interest rates above the 15 percent mark, taking the lump sum is probably the way to go. Pay off your debt, and start putting the money you were spending on payments into savings. But if you’re not significantly in debt, the decision can get more and more complicated. If you’ve been reading Millennial Money Man for a while and you’ve already knocked out your debt (good job! ), then a payment schedule might be in your best interest. Having an extra $700 a month for the foreseeable future can be a great way to take up investing. Run the numbers and see what your current debt costs you per year, versus how much you’ll lose by taking the lump sum instead of the payments. The quick and dirty is that you’ll get more money the longer you wait to receive it, since in the end you’ll get more money by taking the payments than by getting the lump sum. And then later, if an emergency comes up, there are always ways of selling future payments for a lump sum. And it’s true, these lawyers often win cases against companies to get people the money they need to restart their lives after something really terrible happens. Hopefully, if something goes down, you get a lawyer and they can get you some cash out of it. More and more frequently, the money these lawyers get someone who’s been harmed comes in the form of a structured settlement, which is a type of annuity reserved for these situations. It basically takes money from the people deemed at fault and puts it in an annuity through an insurance company that then pays the injured or wronged person a series of payments. Because let’s face it, if someone wrongs you, the last thing you want is to be financially tied to them over time. A structured settlement allows the wronged person to instead work with an insurance company and part ways with the at fault party. They typically mean more money gets in the hands of the injured person in the long run. And again, there are options for selling payments if you find yourself in a bind down the road. Hopefully you’ll never need this stuff. I hope your parents have long happy lives and that you never have to go through a traumatic personal injury: But, having a solid plan in place if you do could save you big. This is actually such a great post – it explains the concept of an annuity really well, and it’s easy to follow and fun, which is not often the case with insurance-type posts about concepts, haha. Way to consistently be a great source of valuable info, M$M – and thanks for the awesome post, Catherine! Thanks Des! Definitely a tough concept to sell to my readers because it’s not a common subject, but it’s important to have a basic understanding of annuities. Unfortunately something that many of us will deal with in the coming years. Thanks for reading!